I’m a mobile DJ and full wedding entertainment service provider, available to attend weddings in and around Bristol, Bath and Swindon as well as many other locations across Gloucestershire, Somerset and Wiltshire. Being a young and upbeat wedding DJ, I always get as many people on the dance floor as possible to make your wedding reception a night to remember! From your first dance to your big finalé, let me know the types of music you love so I will know exactly what songs you will enjoy – whether that’s by email or a face-to-face meeting, it’s completely up to you. I’ll create a party vibe that will get your guests up out of their seats (and their heels!). Wedding DJ Hire can be available from 7pm – midnight. If you would like me to come later or earlier, please let me know when booking. Top tip: It’s a nice touch to include a song request slip in your invitations to make your guests feel included in your big day! Hire a wedding DJ who gets the party started! When you hire Kieran Clarke’s wedding DJ services I aim to make your wedding planning experience less stressful. Not only do I offer a no-fuss service, my wedding DJ prices include disco lighting, a smoke machine as well as a DJ booth lit up in the colour of your choice – whether you match it to your bridesmaids dresses, your overall theme or simply want to go for a pure white glow. I’m a one-stop shop for your wedding entertainment, offering wedding venue décor such as uplighting and giant light-up LOVE letters, special effects like indoor pyrotechnics, dry ice and confetti cannons, photo booth hire and video booth hire. 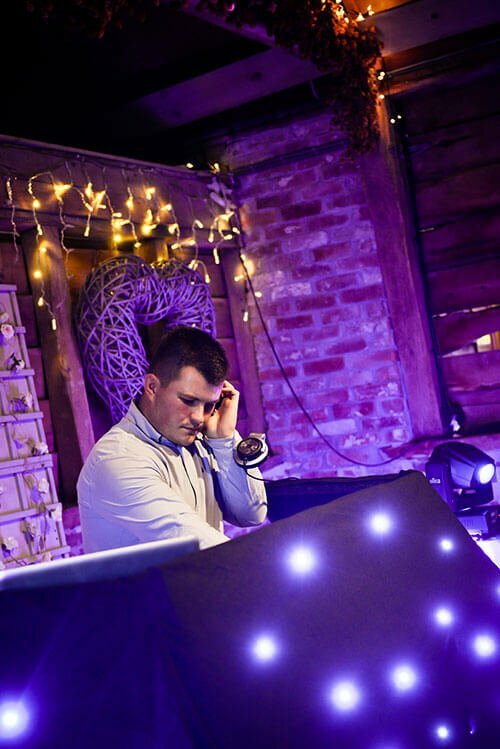 For more information and to book Kieran Clarke’s wedding entertainment services, give me a call on 07849 150 594 or email info@kieranclarkeents.co.uk and I will get back to you as soon as possible regarding my wedding DJ services.